Right now, nearly 29% of the population helps provide care for chronically ill or disabled family members or friends. In fact, if you’re one of the 65 million people who currently provides care for a loved one, you know exactly what I’m talking about (National Alliance for Caregiving). Too often, however, some think that caregiving is someone’s private business. Something that has nothing to do with your work. Something that shouldn’t be talked about when you’re at work. Something that doesn’t spillover into your work life. Unfortunately, they’re wrong. 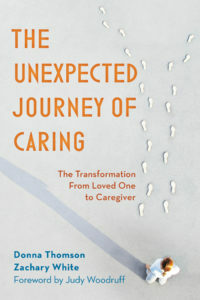 As a communication professor who conducts research on working caregivers, most people initially tell me, “No, not me. I’m not a caregiver.” However, only minutes later, they usually correct themselves and acknowledge that they too are caregivers even though they don’t think of themselves as a caregiver. Most caregivers are just like you and me—loved ones who provide, on average, 20 hours a week of unpaid care for someone in their own home—a mother, father, spouse, child, or grandparent. If your wife is diagnosed with breast cancer, you won’t tell her you’re not a caregiver. If your child needs extra care, you won’t inform him that you’re not a caregiver. If your mother is ill, you don’t say you work full time so you can’t help. Too often, we tell ourselves and others that we aren’t caregivers because we feel caregivers have special training and fancy titles after their names. In reality, few people choose to be an informal caregiver—it’s simply what happens when you are drafted to care for those you love while also trying to negotiate the countless other responsibilities in your life. If you aren’t a caregiver now, the odds are that you will become one. By 2020, approximately 157 million Americans, nearly half of the U.S. population, will live with a chronic illness (Dpt. of Health and Human Services). In other words, care isn’t something that only some people will do, it’s something every one of us will need to provide at some point during our working lives. Caregiving is quickly becoming a rite of passage in American life. Caregiving isn’t a women’s problem or a man’s problem—it’s an organizational challenge, especially when nearly 70% of working caregivers experience work-related challenges as a result of their dual working-caregiver roles (AARP). How can I share my dual role responsibilities at work without showing weakness and vulnerability? How can I share caregiving challenges when I don’t want my peers at work to think my productivity and performance will suffer? How much should I disclose and to whom should I disclose so people at work know what I’m going through right now? Our working caregiving challenges can’t be neatly tucked away into discrete boundaries. Spillover happens in all of our lives, from work to home and from home to work. Whether we want to acknowledge it or not, what happens outside our organizations affects what happens inside our organizations. The reality is that how you feel about the people you work with inevitably affects how you think about your organization and how you think about your organization is always impacted by your relationships at work. If others at work don’t know or appear not to care about what you’re experiencing, how you think about your work and your company can’t help but be affected. Too many of us believe we are either a caregiver or not. In the 21st century, categories like working caregiver make us think that we’re either working or not working, caregiving or not caregiving. Unfortunately, these either-or labels don’t reflect the changing landscape of the 21st century that requires us to be simultaneously employees and caregivers, caring and working, working and caring. Do you want to know more about how and in what ways people like you are attempting to cope with the challenges of dual roles? As employers, are you interested in learning more about the challenges your employees are experiencing so you can enhance employee identification and increase morale? If so, please register to join us on September 12, 20013 for the Work-Life Forum (http://www.queens.edu/work-life) at Queens University of Charlotte.